Get Comfortable at Hotel's Suites in Allentown, PALooking for extended stay hotels in Allentown, PA or a place to stay for just one night? The Staybridge Suites Hotel Allentown West offers apartment-style suites only moments from the heart of this thriving city. A hub for the arts, corporate business and innovation, Allentown, Pennsylvania promises hotel patrons a memorable stay.If work brings you to town, our property is a great choice. 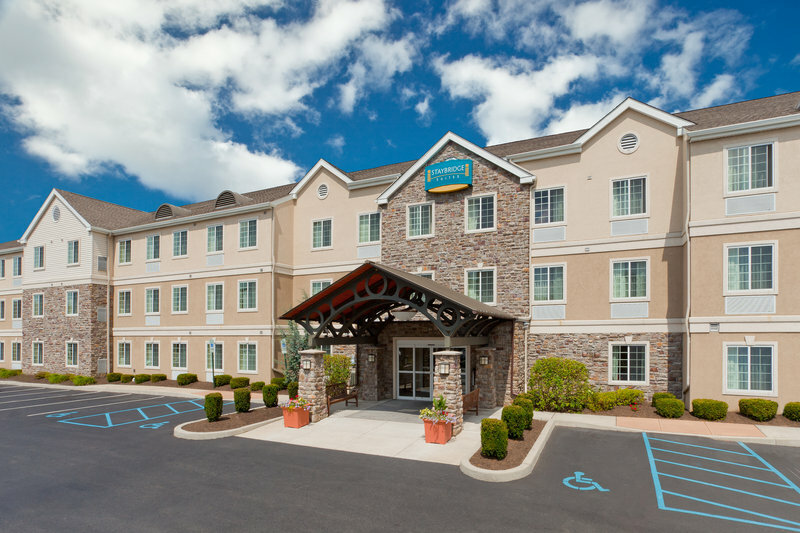 Ideally situated off I-78 and Route 100 in the western part of Allentown, this Pennsylvania hotel ensures easy access to Lehigh Valley International Airport (ABE), Iron Run Corporate Center, Lehigh Valley Industrial Park, Nestle and Air Products. Meetings are also a cinch thanks to a 600-sq-ft event room, and the 24-hour business center provides copy, fax and print services. Clover Hill Vineyards & Winery, just down the road, offers tours and tastings to delight. At this pet-friendly hotel, patrons stay connected with free Wi-Fi access, active in the fitness center and satisfied thanks to a hearty, free breakfast buffet. Free laundry facilities are open 24/7, as is the Pantry snack shop. Make this your home away from home! Meeting Room: Our ground floor meeting room holds 30 people classroom and 40 people theatre. Breakfast and catered lunch options available. Olde Homestead Golf CourseOlde Homestead's 18-Hole Golf Course features a restored 1910 farmhouse (Clubhouse), a 1700's summer kitchen with bake oven. Olde Homestead's friendly atmosphere accompanied by these historical features allow visitors to feel as though they've come home. Dorney Park & Wildwater KingdomDefy the rides, brave the waves. Enjoy twice the fun at Dorney park & Wildwater Kingdom. It's 2 great parks for the price of 1. Enjoy a universe of exciting coasters and thrill rides galore, 22 soaking water slides and 2 giant wavepools. Valley Preferred Cycling CenterValley Preferred Cycling Center is the premier velodrome on the east coast. Allentown FairgroundsThe Allentown Fairgrounds is home to the Allentown Farmers Market and the Great Allentown Fair. Bethlehem-DowntownVisit historic Bethlehem for Art, Theater, Music, Shopping and Dining; there's always so much to do in Bethlehem. Lancaster County / Amish CountryMany folks are drawn to Lancaster County for the Amish community, but soon discover and enjoy all the other things to see and do when they visit Pennsylvania Dutch Country. Reading Factory Outlet MallsVisit Reading, PA's own outlet center. For first quality name brands at discounted prices, it's where savvy shoppers enjoy serious savings. Cabela'sCabela's Hamburg, PA Retail Store is located just off I-78. In addition to offering quality outdoor merchandise, the massive 250,000 sq.ft. showroom is an educational and entertainment attraction. DaVinci CenterScience Center offering and exhibit floor of nearly 10,000 square feet. Clover Hill VineyardVisit this local Pennsylvania Winery for wine tasting classes to see the local flavor. MusikfestOne of the largest music festivals on the east coast, Musikfest runs each year in early August for 10 days. combining big name acts with local favorites, this festival is one for all. Crayola FactoryAt the Crayola Factory, you'll be immersed in color and creativity-a place where there's no limitation to creativity and imagination. You can color, draw, paint and create with the latest Crayola Products.